Muhammad Hosni Sayyid Mubarak (Arabic: محمد حسني سيد مبارك‎, Egyptian Arabic pronunciation: [mæˈħæmːæd ˈħosni ˈsæjːed moˈbɑːɾˤɑk], Muḥammad Ḥusnī Sayyid Mubārak; born 4 Mey 1928) wis the fowert Preses o Egyp frae 7 October 1981 tae 11 Februar 2011. Mubarak wis appointit Vice Preses o Egyp in 1975, an assumed the presidency on 14 October 1981, follaein the assassination o Preses Anwar Sadat. The length o his presidency makkit him Egyp's langest-servin ruler syne Muhammad Ali Pasha. Afore he entered politics, Mubarak wis a career officer in the Egyptian Air Force, servin as its commander frae 1972 tae 1975 an risin tae the rank o air chief marshal. Mubarak wis oostit efter 18 days o demonstrations durin the 2011 Egyptian revolution. On 11 Februar, Vice Preses Omar Suleiman annoonced that Mubarak haed resigned as preses an transferred authority til the Supreme Cooncil o the Airmed Forces. On that day Mubarak an his faimlie left the presidential palace in Cairo an muivit tae Sharm el-Sheikh, Egyp. 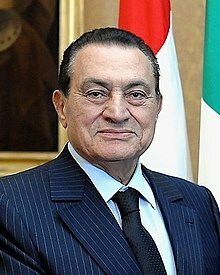 ↑ "Profile: Egyptian President Hosni Mubarak". Xinhua News Agency. 10 February 2010. Retrieved 11 February 2011. ↑ Kirkpatrick, David D. (28 January 2011). "Egypt Calls In Army as Protesters Rage". New York Times. Retrieved 28 January 2011. ↑ Kirkpatrick, David D.; Shadid, Anthony; Cowell, Alan (11 February 2011). "Mubarak Steps Down, Ceding Power to Military". New York Times. Retrieved 11 February 2011. Wikimedia Commons haes media relatit tae Hosni Mubarak. This page wis last eeditit on 4 Mey 2018, at 08:22.